Age related macular degeneration (ARMD) is the commonest cause of blindness in the Western world in those over 50 years of age. The damage in ARMD as the name suggests principally occurs as a result of wear and tear in the macula (Fig 1a, Fig 1b and Fig 1c). A person with macular degeneration loses the ability to see fine detail centrally for near and far, however it is important to realize that the patient does not become completely blind and the peripheral vision remains preserved. 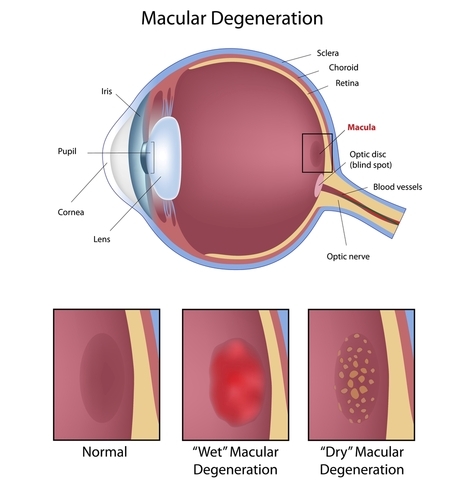 There are different types of macular degeneration which is explained in the following questions. What are the different types of ARMD? There are two types of ARMD: a ‘dry’ type and a ‘wet’ type. 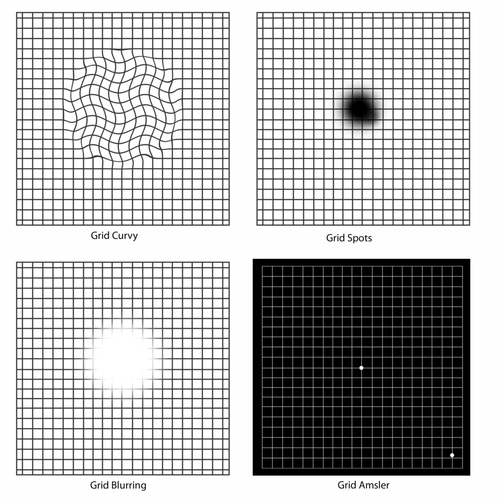 The dry type results from the gradual breakdown of light sensitive cells in the macula area, resulting in a gradual blurring of central vision. Dry ARMD is present in the majority (85-90%) of patients with macular degeneration. Patients with the early stage of dry ARMD may be unaware that these changes are present in the macula area and may have normal vision. In a minority of cases, these early dry changes can progress and cause significant visual loss. Fortunately dry ARMD is not as aggressive as wet ARMD, although currently there is no effective treatment to halt or reverse these dry changes. Dry ARMD can change and become the wet form. Wet macular degeneration affects only about 10- 15% of people who have ARMD but it accounts for two-thirds of the people who have significant visual loss. The main problem in wet ARMD results from age related wear and tear of a barrier (bruchs membrane) which keeps blood vessels in the choroid layer apart from the retina (pic c3). Choroid is the most vascular part of the body, full of ‘leaky’ blood vessels to help oxygenation of retina. 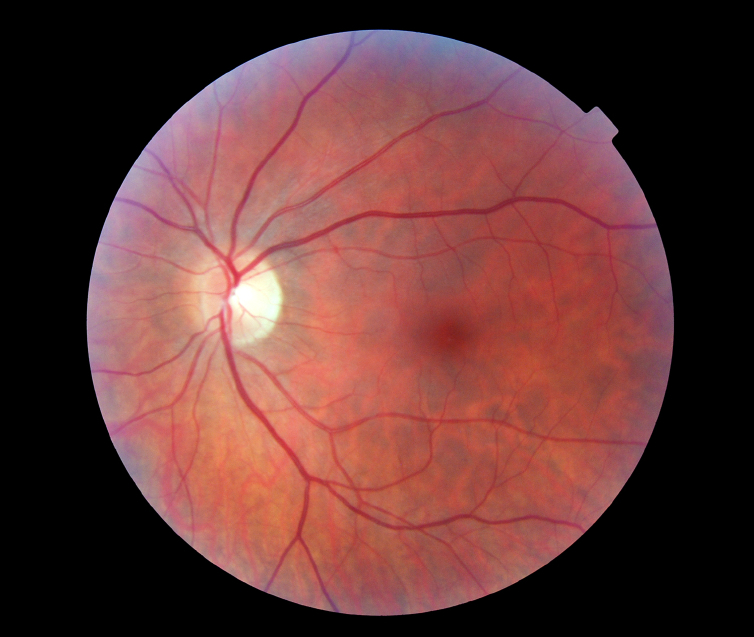 Retina by contrast has no leaky blood vessels under normal circumstances. As this barrier breaks down blood, ‘’leaky’’ blood vessels from the choroidal layer grow into the retina and start leaking blood and fluid in the macula area. Disorganisation of the macula photoreceptors results in visual failure and distortion. In the dry form of ARMD there is also disruption of the barrier and the photoreceptor layer, however there are no leaky blood vessels, hence he term dry. The dry form tends to be slowly progressive and although there is no specific treatment of dry ARMD, only 10% of those registered blind from ARMD are due to the dry type whilst the wet form is responsible for the other 90% of those. Prognosis is therefore worse in the wet form. Prompt assessment is therefore essential for quick diagnosis and treatment if appropriate. Wet ARMD is mainly diagnosed through non-invasive technology using a scanner (Fig e1) and clinical examination. 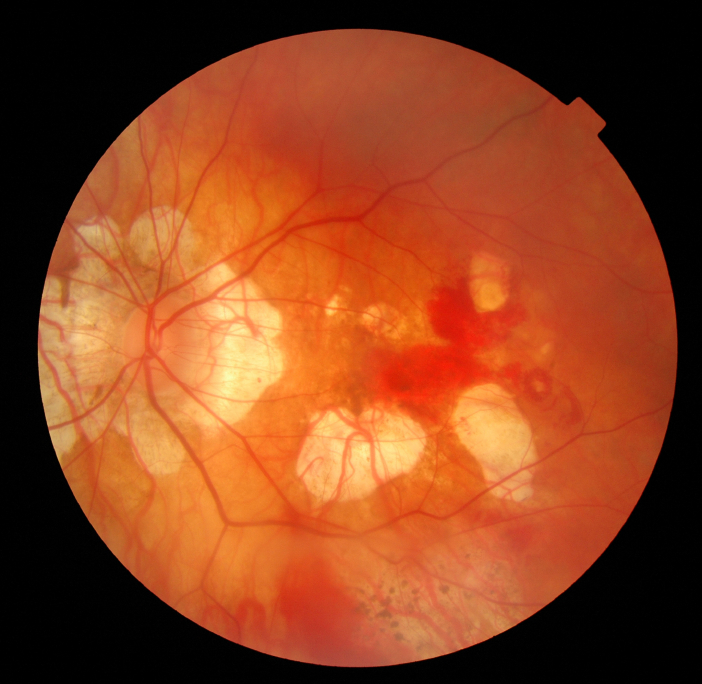 We may also decide to perform a fluorescein angiogram (dye injected through a peripheral venous line) to confirm diagnosis and see the abnormal vessels in the retina. Recently a new dye less and non invasive technology has been developed, known as OCT angioghraphy, whereby blood vessels in the retina and choroid can be visualised in a 3 dimensional setting. More experience is required with this exciting technology before fluorescein angiography is eventually replaced. These symptoms tend to appear much more rapidly and aggressively in the wet form of ARMD than the dry form. In fact some patients with dry ARMD may not have any symptoms at all. An Amsler chart will help in these situations to detect a sudden change which may indicate wet transformation from dry form. The list of these symptoms are not exhaustive and if you are concerned you must consult a healthcare professional. If you have any new symptoms such as those shown here or any change in the straight line you must report this immediately to an ophthalmic health care professional. What is the treatment for wet ARMD? The current management of those diagnosed with wet ARMD is through a series of injections into the jelly part of the eye under local anaesthetic. Lucentis, Avastin and Eylea are all treatment choices that are available to you. This group of drugs are known as anti vascular endothelial growth factor agents (anti VEGF). Eylea and Lucentis are licensed products in UK and are available for treatment of wet ARMD as long as certain clinical criteria are met such as your level of vision at presentation and absence of scarring at the macula. Avastin is off label and off license product and is mainly used in those whom National Institute for Health and Clinical Excellence (NICE) has excluded from receiving treatment on NHS as they don’t fulfill the required criteria. These patients may decide to seek treatment privately to prevent further deterioration of vision. Several large randomized controlled trials have indicated that Avastin and Lucentis work with the same efficacy with no significant difference in visual outcome between them. Avastin Is significantly cheaper than Lucentis or Eylea in those whom are funding the treatment themselves and is widely used in Europe and USA with great success. These injections aim primarily to halt progression of abnormal blood vessels and stop the leaking and bleeding in the retina. These drugs prevent significant visual loss in 90% of cases (significant is defined as loss of more than 15 letters in ETDRS charts used in trials) and even improve vision (up to 30%-40%). We expect that for the first 2 years you will be seen in on a regular basis (monthly) though depending on treatment pathway and response these appointments can be decreased in frequency. It is noteworthy to mention that without anti VEGF injection treatment, the vision can worsen quickly and significant visual loss can ensue within a few weeks to a few months. This reduction can be permanent. Prior to the development of these injections, laser treatment (photodynamic therapy- PDT) had been performed. Trial data suggest that injection are significantly superior to PDT laser although in a very few majority of patients this laser may still have a role. Mr Kashani can discuss with you if this mode of therapy is a viable option for you. Lucentis, Avastin and Eylea are administered in form of an injection in to the eyeball and although this sounds very frightening and unpleasant, almost every patient (>99%) tolerates the procedure with strong anaesthetic drops. The procedure time is within few seconds but pre and post operative checks are needed at each visit. The whole process from initial checks, injection delivery and final checks should take no longer than 10 minutes. Once we have completed the pre operative checks, the eye receives an aneasthtic to numb it and povidone Iodine is placed in to minimize infection. Then a drape is placed in front of the eye and a small clip is used to keep the eye open. More aneasthetic drops are placed in and at this point we check the sensation of the eye. Then the injection is administered at a predetermined location. A drop of an antibiotic is used and drape is removed and skin cleaned accordingly. We check the pressure in the eye if the patient is at risk of developing high pressure. How often will I need treatment and what are the risks? It is very hard to estimate how many injection you may require. This depends on the nature of the wet ARMD lesion, treatment pathway and response to treatment. Some patients may only need the loading dose and no further treatment is required and some may need an injection each time. The first three injections known as the loading dose are mandatory and after this you will need another injection if the ‘lesion’ is active. As mentioned treatment frequency is also different depending on which pathway you are started on. Mr Kashani will discuss the choice f agent with you fully before starting treatment. Like any medical procedure there is a small risk of a complication from Anti VEGF injections.. Here I have listed the main complications from the procedure, although it must be emphasised that such events are unusual and permanent loss of vision as a result of the injection is rare. What does the future hold for ARMD? What do I do if I think I have wet ARMD? 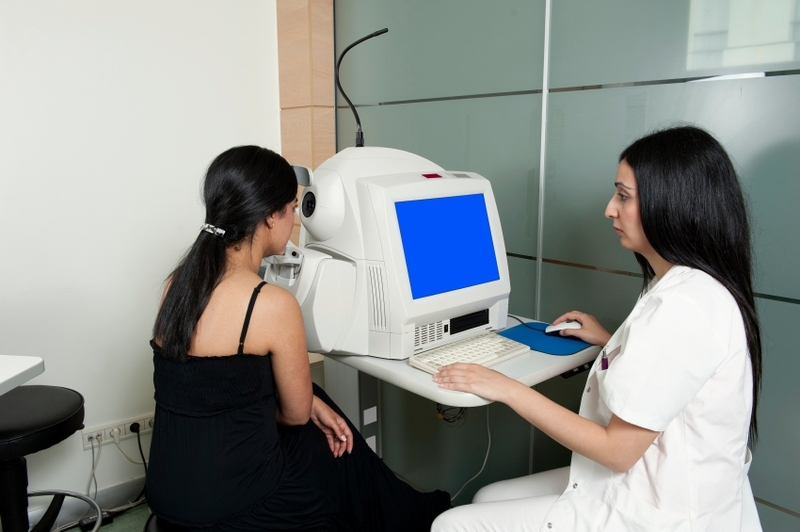 You must urgently see an optician (within 24 hours) and be referred in for an OCT retinal scan to confirm diagnosis. Does NHS provide cover for wet ARMD? Yes it does as long as you meet criteria set by NICE https://www.nice.org.uk/guidance/TA155 (Ranibizumab) and https://www.nice.org.uk/guidance/TA294 (Aflibercept) for treatment. If you have private insurance, most companies will support part of your treatment through your insurance even if NICE criteria is not met and your consultant feels that you will benefit from treatment. Other options if NICE guidance is not met include PDT laser or funding the anti VEGF agent yourself. The choice of agent, duration of treatment and the financial implications (in case of self funding patients) will be discussed in full at time of consultation. Can I have cataract surgery if I also have ARMD? Yes but the timing of the surgery needs to be very carefully planned. I ideally would like a period of lesion inactivation before I suggest surgery if there is a visually significant cataract. In some patients this situation is not possible and other strategies are used to minimize risk of progressive vision failure from ill timing of surgery. This will be discussed with you fully at consultation if we have decided to proceed with cataract surgery. The evidence for use of high dose multivitamins in patients who are at high risk for developing advanced ARMD is from the AREDS (Age Related Eye Disease Study) trials. The treatment can reduce the development of advanced ARMD by up to 25%. Your eye care professional can tell you if you have ARMD and are at risk for developing the advanced form of the disease and whether this treatment is right for you.